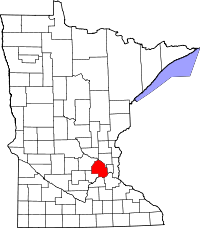 Hennepin County, the most populated county in Minnesota, has a number of local service centers where individuals can obtain copies of vital records. All of the required applications are provided on the county website, all of which can be taken in person to an office, mailed in, or faxed, along with locations and addresses of all the various service centers. The website also offers the ability for users to schedule appointments online at any of the locations. Hennepin also refers the VitalChek service for those wanting to order copies of records online. The Hennepin History Museum has a library with with a large amount of genealogy and local history resources; access is free for members, and $5 for adults nonmembers. They also have a comprehensive links page which contains further resources and links to additional organizations in the area. Note: A 2nd fax number is 612-317-6293.